As winter draws near in the Northern Hemisphere, avid cyclists and even recreational bicyclists still enjoy their rides, whether for fitness, fun, or transportation. 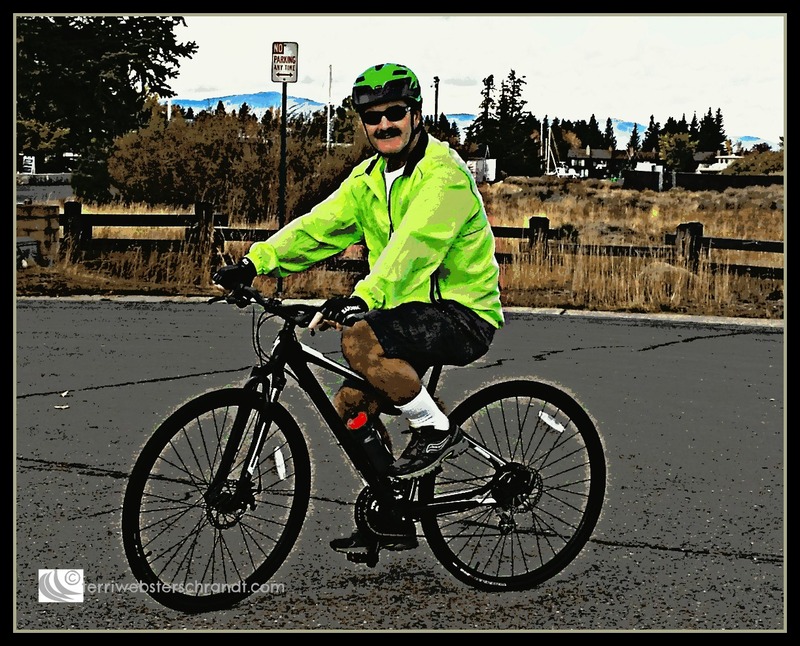 For my Leisurely Thursday post, I share tips to help you with your fall and winter cycling experience. In temperate climates like California or Florida, where cycling can be enjoyed almost year round, fall and winter can still bring surprises to your ride. Be mindful of the time of day you ride your bike. As winter sets in, there is a lot less daylight. Plan your ride for daylight hours when possible. Motorists have enough trouble seeing cyclists in broad daylight, let alone in dawn or dusk hours. Get a good headlight and use it when the sun is low in the sky. You need a flashing red tail-light so others can see you. If you commute and ride at night, take extra care and use as much light as possible. Darkness may also bring on undesirable loiterers. Urban bike trails can be places where homeless build their camps. Although law enforcement tries to minimize and mitigate this practice, campers and loiterers are more prolific especially in temperate geographical areas where winters are not as harsh. If you see suspicious activity, quickly ride past and avoid stopping. Even in daylight hours, be mindful of where you stop for a break. Assaults happen to both women and men. My hubby recently experienced a flat tire near dusk. Even with his tire kit, it still took him longer than expected and darkness was upon him before his ride was done. He went out the next day and bought the headlight! 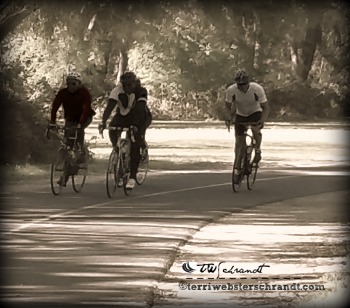 Fall and early winter can be great times for riding long distances because of the cooler air. While it may feel great to ride extra miles in 50 degree temps, the urge to drink water will lessen due to the cold. Force yourself to drink more water, even if you do not feel thirsty. Our area experiences the dry north winds which feel cool, but are very dehydrating. Also, bring food for a long ride. In cold air, you will burn more calories. Fall and winter weather can be capricious and unsettled. If you plan a long ride, check the local weather for changes. What may start out as a warm sunny day can end in stormy, rainy weather. Changes in seasons and weather can also add more debris on the roads and trails. Autumn will find leaves, nuts, and other tree-fall that can be dangerous when ridden over. If you ride on urban trails, be mindful of rodents that are hoarding nuts for their hibernation and winter nap. Squirrels are known to dart out suddenly onto roads and trails and can cause accidents to unsuspecting cyclists. Other animals may be seen on the roads and trails, like deer, waterfowl and other creatures foraging for food. In late fall and winter, ice and snow can be issues. Watch for black ice on roads and urban trails and keep your eyes on the road. It is easy to get distracted while riding and fiddling with your phone, and therefore miss seeing the acorn or ice patch that takes you down. More road debris can flatten a tire quickly, so be sure to pack your tire change kit, even if it is just a short leisurely ride. Pack two tubes just to be safe. Layer your clothing so that if you feel warm, you can change, then add it when you feel cold again. If your arms and legs are bare, use sunscreen, even on a cool, cloudy day. UVA and UVB rays still penetrate cloud layers and can cause sunburn. Lotion helps with windburn as well. Wear bright, reflective clothing to be more easily seen by motorists. This can be added as a top layer over winter garb. Protect your mobile phone in plastic or something to protect it from moisture. Even if you wear your phone next to your body, wrap it, so perspiration doesn’t destroy it. Many retail stores sell great winter cycling clothing. I’ve seen lots of riders add arm and leg warmers, helmet covers and toe warmers to their normal gear to help fend off the cold. Since my hubby is bald on top, he wears a bandana under his bike helmet to keep his head warm. Wearing a headband under your helmet also keeps your ears warm. Wearing gloves is also recommended to keep your hands warm and responsive. I like to wear sunglasses when I ride, even on cloudy days, to protect my eyes from wind, rain, grit and bugs. The cold air always makes my eyes tear, so I also carry a small handkerchief with me. Clear lenses are also available from your retailer. Before you head out on your winter cycling experience, check with your local bike retail store and get tips from the pros. And of course, have your bicycle checked thoroughly and tuned up if necessary. Many cyclists change their tires to a more robust tread. Add a mudguard to prevent water and mud from hitting your backside and riders directly behind you. Depending upon where you live (ride), your bike can get very dirty from mud, debris and salt from the road. When your ride is done, clean the chains, brakes, and tires as soon as possible. If you absolutely cannot go out on your bike, at least go to the gym and ride the stationary bike as a LAST resort! For those in the Southern Hemisphere who are experiencing spring and soon, summer, please read this post…15 Summer Cycling Safety Tips. For more cycling tips, check out this blog, Fit is a Feminist Issue, specifically Proper Bike Fit and Two Bike Cultures. Cycling is a wonderful way to exercise and stay fit even in cold weather. Challenge yourself to ride and use these tips to help you! Do you cycle in the fall and winter months? Tell me about it! #Wednesday’s Wisdom; a practical helpful topic. I recently started riding again after a long break so cycling advice is needed but hard to find. thanks for covering the basics so well. That is great to hear! Glad you found the tips helpful! Terri, thanks so much for joining The Pinterest Game with the pin to this post. All the best. We hope to see more of your pins on Friday. Thank you, Lucile, I appreciate your comments as a cyclist! Today we had rain with a lot of wind, so I’ll bet there is debris all over the roads! Cycling indoors sounds better and better! Thanks for stopping by Diane and sharing your comment! Always nice to see another cyclist! I love indoor cycling. Outdoor sounds a lot of fun though. Love your post. Yaz. My son who lives near Tampa just traded in his big motorcycle for a big water bike.. a skidoo? But big. Very big. No doubt he’ll want me to ride it next time we visit. That sounds really cool, Janet. Yes, take it for a spin! And get a photo!